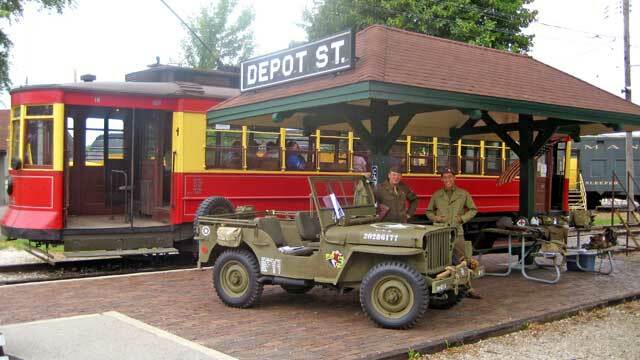 Ride a troop train or the Anzio Express; see skirmishes, battles and even sabotage; visit the North Platte Canteen and more, at WWII Living History Days at Illinois Railway Museum in Union, May 19-20. March 17-18, 10 a.m.-4 p.m. This group builds trains, skyscrapers, castles, Star Wars, Harry Potter and more, entirely out of LEGOs. $5/$3 GHC members & students. Geneva History Center, 113 S. 3rd St., Geneva, (630) 232-4951, genevahistorycenter.org. March 18, 3-4:30 p.m. Learn about the sandhill cranes as they arrive this spring – their journey north, their life habits and why they nest in McHenry County. Lyons Prairie & Marsh, 7500 Hickory Nut Grove Road, Cary. Register: (815) 479-5779, mccdistrict.org. March 24, 5:30-7 p.m. Indoor presentation followed by a carpool to the marsh to try to see cranes. Dress for outdoor hiking. Lost Valley Visitor Center, Glacial Park Conservation Area, 6316 Harts Road, Ringwood, (815) 479-5779, mccdistrict.org. March 24-25, 10 a.m. All local remodeling, renovations and repair experts under one roof. Free adm./parking. Kane County Fairgrounds, St. Charles, (630) 584-6926, chicagohomeshow.net. March 24-25, Two days of soul-warming music with talented musicians in venues all over town. Historic Long Grove, (847) 634-0888, longgroveonline.com. March 25, 6 p.m. This is the only nationally televised pageant for married women, focusing on the versatility of the contemporary American married woman. Tickets/info: (630) 325-4305, pageants@mrsillinoisamerica.com. Hemmens Cultural Center, 45 Symphony Way, Elgin. March 30-April 1, 9:30 a.m. Over 300 booths with jukeboxes, pinball & arcade games, slot machines, neon signs, Coke machines and signs, circus and carnival items, more. Pheasant Run Resort, 4051 E. Main St., St. Charles,. Info: (815) 353-1593, chicagolandshow.com. March 31, April 28, 7-8:30 a.m. Meet at the museum for a short introduction, then head to Lords Park Zoo to assist in feeding the bison, deer and elk. Limit 12; register early. Elgin Public Museum, 225 Grand Blvd., Elgin, (847) 741-6655, elginpublicmuseum.org. March 31, 10-10:30 a.m. The annual event at Pottawatomie Park, 8 North Ave., St. Charles, (630) 513-6200, stcparks.org. March 31, 8:30-10 a.m. CARA-certified run/walk along the paved Virgil Gilman Trail and around picturesque Lake Gregory. Blackberry Farm, 100 S. Barnes Road, Aurora, (630) 966-4527, foxvalleyparkdistrict.org. March 31-April 1, 8:30 a.m.-4:15 p.m. Lunch with keynote speaker; workshops from garden and design experts. Morton Arboretum, 4100 Ill. Rte. 53, Lisle, (630) 968-0074, mortonarb.org. April 14, 9-11:30 a.m. For beginners of all ages; must touch worms or be with someone who will. Poles, tackle, bait, prizes provided. Over age 16 need valid fishing license. Rain or shine. Free; advance registration req. Veterans Acres Pond, 431 N. Walkup Road, Crystal Lake, (815) 455-1763, crystallakeparks.org. April 14, 8-10:30 a.m. Search for migrating waterfowl and other birds at Lost Valley Marsh, then share notes and refreshments at the Powers-Walker house. All levels of experience welcome. Glacial Park Conservation Area, 6316 Harts Road, Ringwood, (815)479-5779, mccdistrict.org. April 14, 2-3 p.m. Bubbleologist Geoffrey Akins creates bubble caterpillars, ice cream cones, snowmen, a volcano, dancing bubbles, a bubble merry-go-round, even puts an entire kid in a bubble. Morton Grove Public Library, 6140 Lincoln Ave., Morton Grove, (847) 929-5102, webrary.org. April 15, May 20, noon-4 p.m. Visit the restored 1854 Powers-Walker Greek Revival house and learn about the Powers’ sons and their contributions to the Civil War from volunteers in historical attire. Glacial Park, Ringwood, mccdistrict.org. April 21, 8-10:30 a.m. Learn about this riparian habitat and visit a heron rookery. Canoe equipment provided; BYO binoculars, drinking water. Not suitable for beginners. Hickory Grove Riverfront, 500 Hickory Nut Grove Lane, Cary. Registration: (815) 479-5779, mccdistrict.org. April 21, 11 a.m.-3 p.m. Rain barrels for sale, bicycle tune-ups, Geneva Green Market, a Bicycle Rodeo, free paper shredding, green education, electronic recycling, local merchants, more. Free admission. Peck Farm Park, 4038 Kaneville Road, Geneva, genevaparks.org. April 22, 8 a.m. Challenging USATF-certified course follows the east side main route through rolling terrain of Morton Arboretum. $33/$28 member; $38 on race day. Register online. Morton Arboretum, Lisle, mortonarb.org. April 22, 8 a.m.-3 p.m. Antique/collectible toys, dolls, memorabilia, holiday items from 600 exhibitors. Kane County Fairgrounds, St. Charles, (847) 800-3009, chicagotoyshow.com. April 22, 1-5:30 p.m. Fun activities; 4 p.m. guided hikes with planned trailside activities. Free. Tekakwitha Woods Nature Center, 35W076 Villa Marie Road, St. Charles, (630) 232-5980, kaneforest.com. April 28, 9:30 a.m.-4 p.m. Vendors, demos, seminars by avian experts like vet Karen Shaw Becker; trainer Barbara Heidenreich; Brookfield Zoo curriculum designer and educator Jason Crean; parrot behaviorist Robin Shewokis. Presented by The Avicultural Society of Chicagoland. Kane County Fairgrounds, 525 S. Randall Road, St. Charles. Info: (630) 985-8146, tasc-chicago.org. April 29, noon-4 p.m. Hike the woodlands to see the spring wild flowers and witness local plein air artists painting “in the open air” along the trails. Finished works for sale 3-4 p.m. Children’s activities, guided wildflower hikes at 12:30 & 2 p.m., info on native plants; storytelling, food, music, more. Free. Coral Woods Conservation Area, 7400 Somerset, Marengo, (815) 479-5779, mccdistrict.org. May 4-6, events daily. Chocolate treats, live music, great food, distinctive shopping, chocolate demonstrations, workshops, wine pairings, children’s activities. Historic Long Grove, (847) 634-0888, longgroveonline.com. May 3, 7 a.m. This CARA-registered 5K run, one-mile walk/run & kids 50-yard dash in downtown Crystal Lake benefits the Raue Center for the Arts. Race: Raue Center, 26 N. Williams St., Crystal Lake, (815) 356-9212, rauecenter.org. May 6, 13, 8-10 a.m. Group hike with acclaimed bird artist Peter Olsen to learn about birds. Prairie Oaks Forest Preserve, 7535 Cherry Valley Road, Kingston, (815) 895-7191, dekalbcounty.org. May 12, 7-9:30 a.m. A steady hike through wood- and grasslands to spot species and share notes. BYO binoculars. Lost Valley Visitor Center inside Glacial Park, Ringwood, mccdistrict.org. May 19-20, 10 a.m.-4 p.m. More than 300 Civil War reenactors, 2:30 p.m. battle each day, 19th century medical demonstrations, historical figures, food, Sutler’s Row. Naper Settlement, 523 S. Webster St., Naperville, (630) 420-6010 napersettlement.org. May 19-20, 10 a.m. Ride The Anzio Express and a troop train to the North Platte Canteen. See realistic camps, skirmishes and battles created by WWII reenactment groups. Illinois Railway Museum, 7000 Olson Road, Union (815) 244-7245, irm.org. May 19-20, 10 a.m.-5 p.m. Largest/longest running vintage & custom show; exhibits, clinics, demos, entertainment. Kane County Fairgrounds, St. Charles, (989) 463-4757, chicagodrumshow.com. May 20, 1-3 p.m. A 3-mile hike through the woodlands to observe spring birds and blossoming wildflowers. Uneven terrain. BYO binoculars. Marengo Ridge Conservation Area, 2411 S. Rte. 23, Marengo, (847) 479-5779, mccdistrict.org. May 25, 3-4:30 p.m. Registration req: (630) 232-4542. Peck Farm Park Interpretive Center, Geneva, genevaparks.org. May 25, 5:30-7 p.m. Once-a-year public tour of this private nature preserve, with the largest concentration of white lady’s slipper orchids in McHenry County. Registration: (815) 479-5779, mccdistrict.org. Directions mailed to confirmed registrants. Date may change depending on bloomings. May 26, 8 a.m.-noon. CARA-endorsed, 10-mile/5K run/2-mile fun walk with cash prizes. Proceeds benefit Elgin Recreation Youth Scholarship Fund. Registration: cityofelgin.org/foxtrot, (847) 531-7005. Civic Centre Plaza, 150 Dexter Ct., Elgin. This entry was posted on Monday, March 19th, 2012 at 11:58 am	and is filed under Recreation & Destinations. You can follow any responses to this entry through the RSS 2.0 feed. Both comments and pings are currently closed.